Hula Hooping has recently become an International trend. Women, men & children are taking this trend to the next level, not only for fun, but for fitness, community, spiritual connection performance art and entertainment. It is truly fascinating to witness the impact of a simple plastic circle which has created an entire community and quickly spread into becoming a movement over the last decade. Hula hooping has evolved into a dedicated dance practice, as hoopers worldwide personally train, attend workshops, found retreats, and aspire to become professionals. Many hoopers began hooping as a simple hobby, which has turned into an entire lifestyle. From making hula-hoops, to creating instructional DVD’s, Vlogging, designing specific products, hooping has become an absolute industry. Although there is a competitive element to this movement related industry, there is also a comrodary in which hoopers share information and support one another’s successes. Dedicated athletes often times train diligently, whether it be at increasing their flexibility, perfecting and creating specific moves, training with multiple hoops or keeping their cardiovascular systems in top performance shape. Hula Hooping is no longer the hip-shake that it once was, hoopers now manipulate the hoop on and off body like you’ve never seen before. Depending on which plane or angle the hoop revolves, each aspect of hula hooping has a name, a direction or a position in which it is being placed. Like most things over time, hula hooping has ‘matured’ and with it so have those that hoop. Much like any sport, there is a kind of connection that occurs mentally and physically. In this dance, something profound happens as the hooper finds their “flow” becoming connected to their dance in a unified manner. The dancer may combine moves and tricks to create a style that is unique to themselves. In that, a deeper reflection and meaning can begin to emerge. 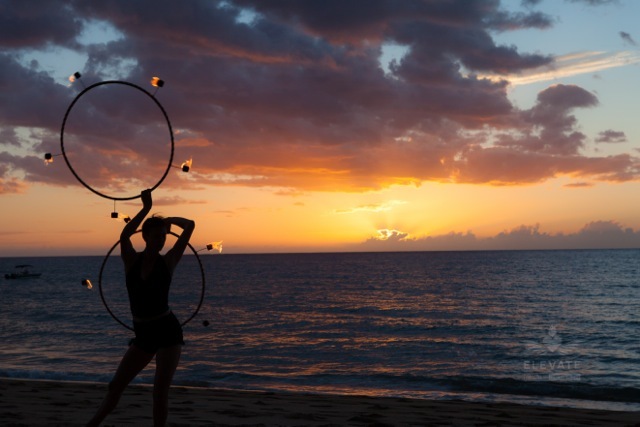 Much like the Sufis practice sustained spinning and felt a divine connection to the One, continual spinning in circles with a hula hoop can create an intense similarity in feeling a connection to a greater source. Hula Hooping has continued to impact people far and wide, it’s legacy has really just begun. So many aspects to this dance reach a variety of people for different reasons at different times in their life. If it’s for fun with your children, weight loss, becoming involved, trying something new, insightful gain or circus training, hula hooping can be the perfect outlet.